Originally, I was going to review a completely different movie for Day 20, but it was bad. In fact, it was so bad I quit watching it a quarter of the way through. That movie was The ABCs of Death, a 26-part anthology film mostly made by criminally insane filmmakers I have never heard of. One of the few filmmakers I had heard of was Ti West. If you’re not familiar, Ti West is horror filmmaker who has made quite the name for himself in the genre with his stylish throwbacks. Working his way up by directing straight-to-DVD dreck like Cabin Fever 2: Spring Fever, Ti made his mark with the memorable 2009 film The House of the Devil. Since then, he’s made The Innkeepers, shorts for both The ABCs of Death and V/H/S/, the critically acclaimed western In a Valley of Violence and of course today’s film. The Sacrament is a unique entry in West’s oeuvre. It’s not a throwback nor it is a conventional narrative film. It’s a mockumentary. A VICE mockumentary to be precise starring AJ Bowen, Amy Seimetz, Kentucker Audley, Joe Swanberg and the old shopkeeper from No Country for Old Men Gene Jones (more on him later). 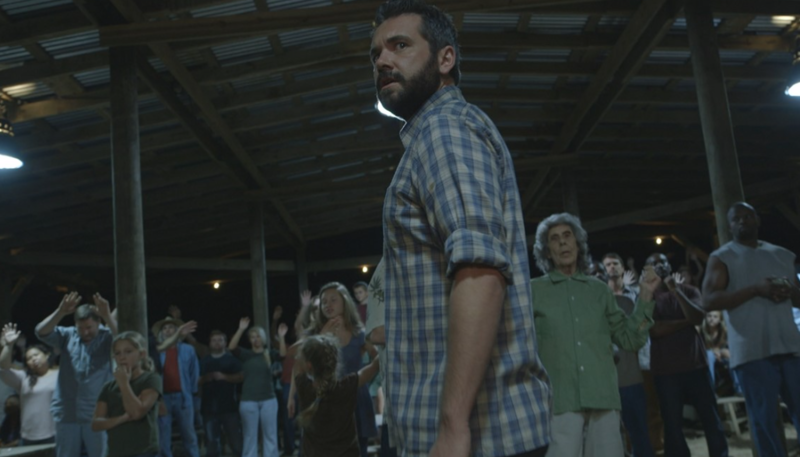 The film was inspired by the tragic 1978 mass suicide in Guyana known as the “Jonestown Massacre.” If you’re not familiar, Jonestown was a commune in Guyana formed by the “Peoples Temple” a religious cult in the 1970s founded by crazy American person Jim Jones. Many were happy in the commune… at first, but as time went by, sexual abuse and false imprisonment of followers occurred. Fearful of his followers fighting back, Jones convinced many to commit suicide via cyanide capsules and forced many others against their will to do the same. This is more or less the story to The Sacrament. 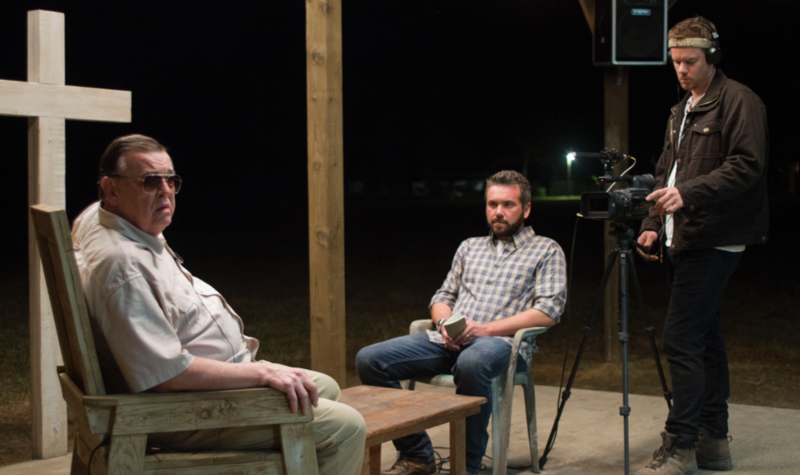 In The Sacrament, a photographer named Patrick (Kentucker Audley) receives a letter from his sister Caroline (Amy Seimetz), that she is now drug-free and joined a utopian society known as “Eden Parish” in an undisclosed location only accessible via helicopter. Patrick enlists the help of Sam (AJ Bowen), a reporter for VICE and his cameraman Jake (Joe Swanberg) to join him. Welcome to paradise. The cult is fairly typical, everyone seems happy but you know there’s something dark underneath. There isn’t anything particularly unique about the cult, they’re just farming and drying laundry outside. It’s kind of a letdown actually. Though this is quickly saved when we are introduced to the cult’s leader, “The Father”, played marvelously by criminally underrated character actor Gene Jones. 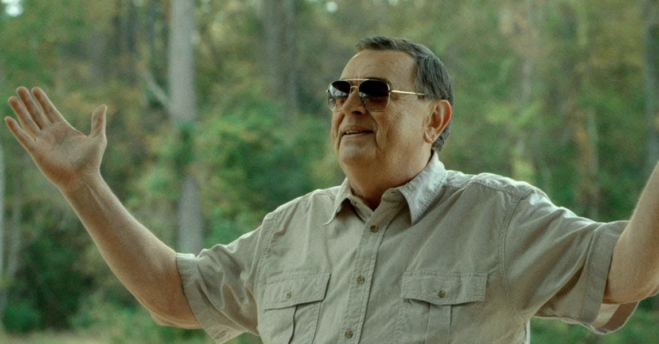 Most of us know Jones from his memorable scene as the nervous shopkeeper in No Country for Old Men, but here he takes center stage. What a joy it is to watch him wet his chops. Jones is charismatic and terrifying all in one grandfatherly package. He’s reason enough to watch the movie. The other characters don’t have much spark, which is the same problem with the rest of the film until it’s visceral climax. 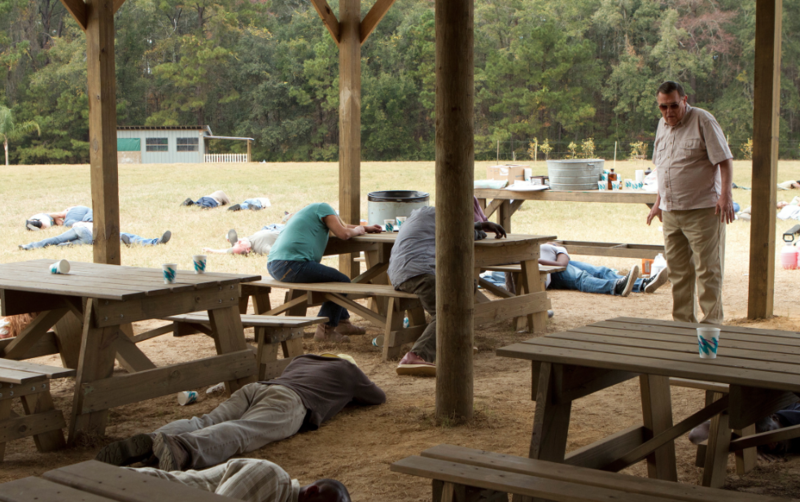 Like Jonestown, The Sacrament ends in a hail of bullets and cyanide capsules. It’s scary stuff, I just wish it didn’t take so long to get there. Initially, Ti West wanted to make a mini-series about Jonestown but couldn’t get the green light from any studios or production companies. It’s a shame because I think that’s a much better story. This is essentially a condensed version done in a unique but unnecessary style. 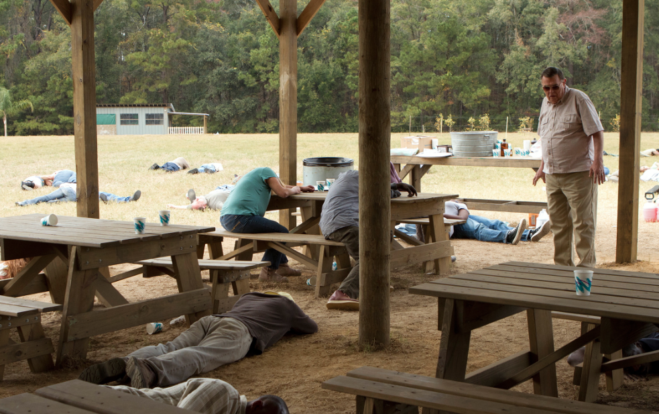 Had West even done just a 120-minute film about Jonestown, I think this would be better. He could still cast Gene Jones too. But instead, we got this, which is fine,but just a shadow of a much bigger story. Otteni out.